Happy Monday babes! I'm switching things up a bit on the blog today. I didn't have an overly exciting weekend so instead of sharing my weekend highlights, I'm sharing my favorite weekend outfit! A lot of times I keep it pretty comfy and casual on the weekend and while this was one of those times, I actually put a little thought and effort into an outfit so I figured why not? And I'm still linking up with my blogger bestie, Biana, of course! Saturday morning it was a bit cooler in the morning but got up into the low 80's so I threw on an outfit that would be comfy and keep me warm in the morning and not overly hot in the afternoon to grab some coffee and run some errands. These moto leggings have definitely become my go-to pants, not only are they stylish but they are super comfy! Not to mention they look great dressed up or down and they're currently on sale for under $25. For this look I kept it pretty casual since I wasn't really planning on doing anything special. I topped off my look with an old Johnny Cash tank and my favorite booties. Fun fact for those who don't already know, Walk the Line is one of my favorite movies! I'm definitely a huge Johnny Cash fan and I think Joaquin Phoenix and Reese Witherspoon did such an amazing job in the movie. If you follow me on Instagram you'll already know that I finished my Saturday in this outfit by watching Pompeii on the couch with a pint of Halo Top vanilla ice cream! The perfect outfit for a casual Saturday! Hope everyone has a fantastic week! I really love these leggings! Perfect outfit!! So adorable! We had so warm weather this weekend. 78 one day, but the day before was 45 lol. I was happy for some warmth though. Have a great week! This is such a great and fun outfit, perfect for the weekend! 80 degree weather sounds so nice! I love this edgy look girl! You look so edgy and fabulous in this outfit! LOVE the olive skinnies paired with the graphic tank! Love the color of those leggings. They almost look like jeans. Really cute rocker chic weekend outfit. Those are leggings?! So cute! Walk the Line is one of my favorite movies, too. It's so good! LOVE that you're in a tank and love this whole look! I am so bummed I didn't get those pants before they sold out in my size! Loving this outfit!! Dressing for the weather down here can be tricky since it's "cold" some mornings and stifling by the afternoon. You pulled it off well and under $25 awesome!! HOW FREAKING cute do you look???? I am obsessing over this look from head to toe! And I love love those shoes so much! Looking super cute like always! Happy Monday! I love this rocker style!! those pants! they are so cute. 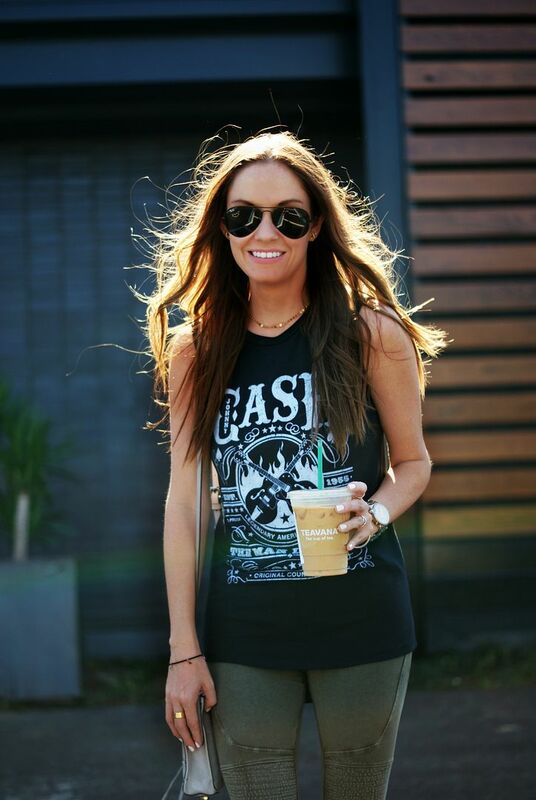 and you know i love my johnny cash tee too :) what a great casual outfit for the weekend - and perfect for the weather i had! happy week girly! it's already off to a stellar start! LOVE those leggings...the color is just perfect! You can rock any look girl...boho, girly, edgy...love it! You're precious. Love this whole look! You're so fab! Love the leggings. Such a cute look. I need me some moto leggings. Those leggings are so cute, but I love your Johnny Cash tank! It always seems like the hardest part about having this weather that's so crazy is dressing for cool and warm weather! I wish that it would just make up its mind! I love that movie too and Johnny & June! Love this outfit on you! I love that they don't even look like leggings- perfect outfit. Hope you have a great week! Love the boots! i'm going to have to look into those for myself! Cute outfit, girl! Love those leggings! Super cute outfit. Love the leggings and the booties - not to mention the country nod with Johnny Cash! This leggings are amazing on you :) Also this is a perfect outfit for Nashville!! Perfect weekend outfit. Cool leggings! Johnny Cash was such a badass- I hear ya, girl! LOVE these skinnies on you! The perfect casual weekend outfit! I loved these leggings when I first saw them a few months ago. I had no idea they were on sale! Going to check them out now!! This whole outfit is so cute! I love the tee paired with the booties! Love this look! Effortless and totally cool. I have those leggings, and they are my faves! Yes girl! You have me wishing for warmer temps. I am just loving this edgy look - so effortles and cool! I love the look of the black on black Ray-Bans!